As Linghucong’s blog states, Netease news is becoming coming into its own with increasing amount of feature articles that possess a well-informed, sharp, satirical edge. For example, check out their latest feature: 2046中国包揽诺贝尔奖 (2046 China Nets All Nobel Prizes). 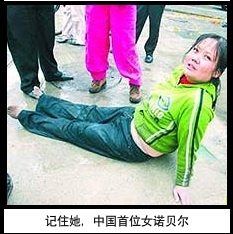 Caption reads, “Remember her, China’s first female Nobel Prize winner.” She is nominated for the Chemistry prize for being the 广州投河自杀未遂女士 (Guangzhou River Suicide Failure Lady). Great resource. Really helpful for understand odbc things. yday! But for some reason redirekted here!? very interesting point of view, has never been conceived of this !